Order received in timely manner, installed, working and all happy. 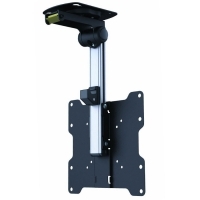 Fold-Away LCD TV Ceiling Mount (20kg Black) + FREE SHIPPING! The perfect folding TV mount for your caravan! This Folding TV/Monitor Ceiling mount is great for saving maximum space and headroom when installing screens into mobile homes, camper vans and caravans, or for small bedrooms and under cabinets. With a clever locking mechanism and plenty of adjustments, this compact ceiling mount is perfect for screens up to 37", weighing under 20Kg, using the VESA standards of 75x75, 100x100, 200x100 or 200x200. The first important feature is the swing-arm, which can rotate down through 120-degrees - making it perfect for pitched ceilings - and finds its level using gravity. The main hinge joint can be loosened or tightened to achieve the correct amount of resistance for your screen weight an application. The swing-arm is also a track for the mounting plate, with an extension range of 130mm, making the distance between the surface of the ceiling and the bottom of the mounting plate between 270mm and 400mm. Next up is the plate which attaches to your ceiling. The plate measures only 165mm x 105mm, so it doesn't need a lot of load-bearing space to attach, and it has a rotation ability of +/- 30° left and right to point the TV towards your preferred viewing position. Finally, the washers, spacers and bolts included in the package should suit most major TV brands for easy installation. All in all, this is a very well put together mount which does exactly what it says on the tin. Please note that this mount is not lift-assisted, so disabled persons may have trouble with heavy screens if not prepared for their weight, and the latch mechanism is not lockable. Screen Size: 19" to 37"
Please double check your clearances to ensure your TV will fit when stowed and extended! Backed by Cable Chick's 5 Year Warranty! Please note: As with all wall or ceiling brackets it is essential that the mount is securely mounted to a stud or beam. If in doubt, please consider professional installation. Due to the size of this item, Express Delivery may not be available. Answer: "I don't believe so as the range of movement is only 120 degrees. Please refer to the 4th product photo which shows the folding range of movement, and may help you confirm the answer to your question." Answer: "This bracket is levelled by gravity and is not suitable for mounting upside-down." Answer: "This bracket can turn 30� left and right from centre for a total of 60�. The 90� specification relates to the folding hinge." Answer: "The main hinge has a tension adjustment bolt which can be changed via Allen key. This allows the screen to be tightened off at angles other than 90 degrees, but is not designed for regular adjustments or to hold a heavy screen up against gravity." Answer: "The weight of the bracket itself is roughly 1.5kg." I needed the Pro Series XLR (Male) to 1/4 inch (Female) Adapter in a hurry. Most impressive. I ordered it at 330pm on Thursday. It arrived the next day in time for the weekend, and the shipping cost was very reasonable. Thank you!